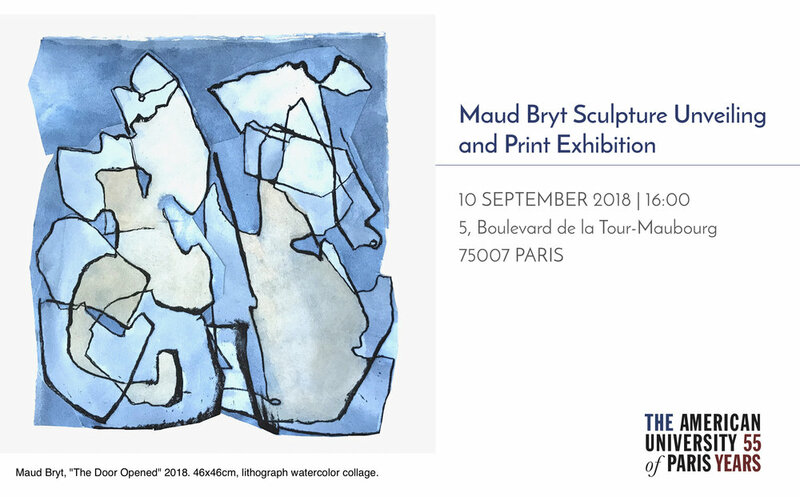 2018 September 10 4pm Unveiling of new sculpture and prints at American University of Paris, 5 Boulevard de la Tour Maubourg. 2018 May 28 - June 10 Visiting Artist at The American University of Paris. 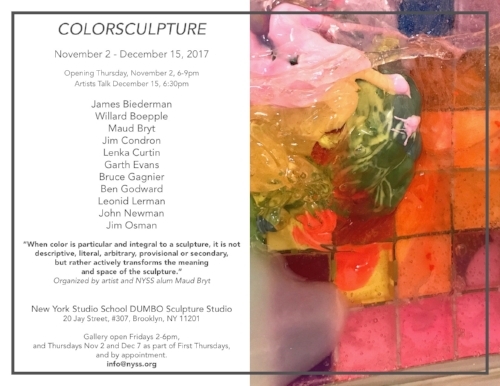 2017 November 2 - December 15 COLORSCULPTURE organized by Maud Bryt, including work by James Biederman, Willard Boepple, Maud Bryt, Jim Condron, Lenka Curtin, Garth Evans, Bruce Gagnier, Ben Godward, Leonid Lerman, John Newman and Jim Osman. 8/12 - 9/21/2017 Solo exhibit of new paintings: T Gallery in Southampton, NY. 7/10 - 7/15/2017 Watercolor Workshop in Sag Harbor/ East Hampton area. Click HERE for photos from the week. 12/28/2016 Read recommendations for 2017 from me and 26 other women artists in Paul D'Agostino's "Flipping Scripts: Art Notes for 2017" in Brooklyn Magazine. 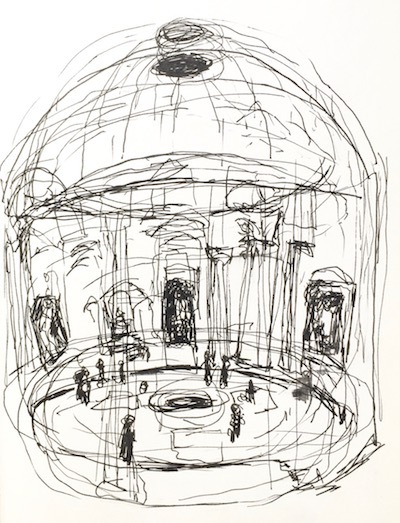 2016 November 6 Sunday Artists Talk join curator Leslie Kerby and artists Maud Bryt, Bob Seng (and Anna Luppi via Skype) for conversation 3-4:30pm at the gallery 156 Fifth Avenue, 3rd Floor. 2016 July 11 - October 7 Group exhibition at the 1285 Avenue of the Americas Gallery organized by Norte Maar and curated by Jason Andrew. Join me at the opening reception at the gallery Monday July 18, 6-8pm. Opening reception: July 18, 6-8pm at 1285 Avenue of the Americas (at 51st Street), New York, New York. I'm included in New York curator Jason Andrew's "LIC Open Studios 10 Must-See-Artists" list! "one of the most unique sculptors I’ve seen working today"-- thanks Jason! Click HERE to see his article. All of the Crowns and the Head (named "Argos" by his new owner) have found good homes! Great and inspiring one-week trip to Rome. Karen Wilkin brought her MFA class from New York Studio School to visit my studio. Lots of good questions and observations from these up-and-coming artists. Two-week Triangle Arts Association Workshop in Salem, NY was a lot of fun and I think I made a big step forward with my thinking thanks to other artists at the Workshop and visiting artists and critics. "Iris" was selected by curator Jason Andrews to be in the New York Studio School Alumni Exhibition 2015. Also this month I was on vacation and painted every day from life. Watercolors on the studio wall once I got back home. Taking a break from sculpture for a few weeks in July, I painted a series of paintings based on my friend's photo of his swimming group. To me it seemed like a great male version of Matisse's The Dance and I had to explore the image. Most of these paintings sold and now live in the UK. The oil portrait I made of my mother-in-law, Bunny Bryt, was accepted into the BP Portrait Award 2015 exhibition at the National Portrait Gallery, London and was exhibited in London, Edinburgh and Belfast over the course of the year. My husband Bartley with "Nana" (60x48 inches, oil on canvas) at the National Portrait Gallery, London. Great review of show at John Davis Gallery by Karen Wilkin in Hudson Review. See page 467. Thank you, Karen Wilkin! Solo exhibition of bronze sculptures in the garden at John Davis Gallery in Hudson, NY. I am so grateful to John for giving me this opportunity. "Eve" on view at John Davis Gallery along with the "Backs", "Adam", and "Crowns"